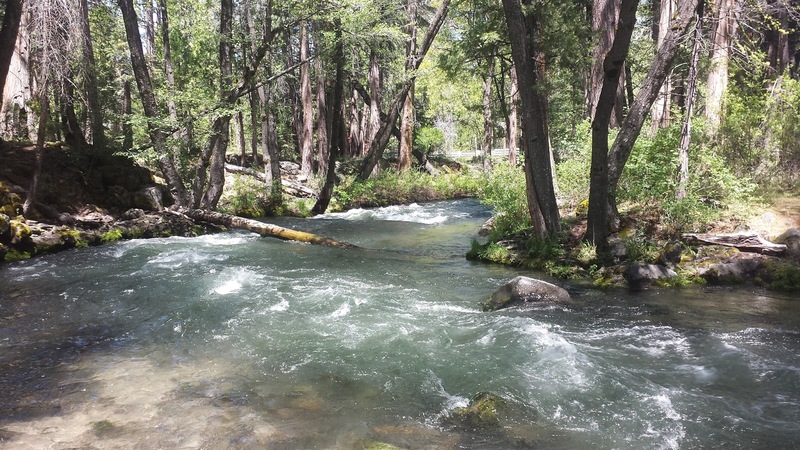 Hat Creek is known as one of the best spring creeks in California. Originating from its headwaters near Mt. Lassen, this creek flows downwards through rugged terrain, meadow valleys, and several campgrounds before reaching Baum Lake. Baum Lake diverts the creek into two flows: one flow directed into the famous Powerhouse #2 and the other below Baum Lake's dam. Both flows eventually merge below Powerhouse #2. 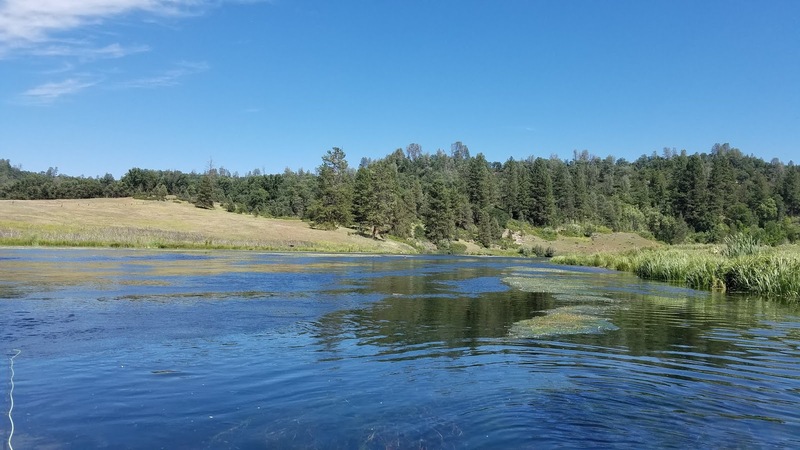 The upper section of Hat Creek is primarily a freestone put-and-take fishery that is well-known for it's large brook trout that are stocked by DFG during trout season. 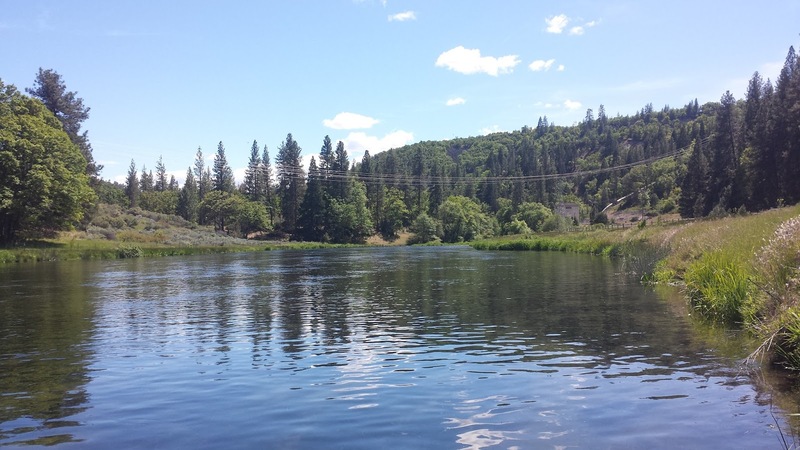 The lower section below Powerhouse #2 is a spring creek wild trophy trout section that is known for it's well-educated brown and rainbows trout. 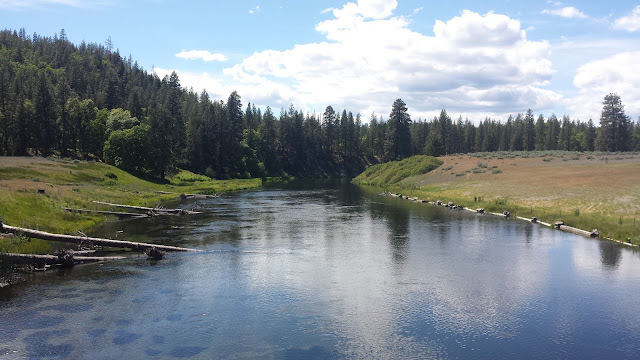 Although Hat Creek is recognized as past it's prime it continues to offer the challenge of spring creek fly fishing. It is one of the few spring creeks in California where you can freely stalk your target and watch as they ignore every single fly you throw at them. A) From Lake Britton upstream to Baum Lake, exclusive of the concrete Hat No. 2 intake canal between Baum Lake and the Hat No. 2 Powerhouse. *Last Saturday in April - November 15th. 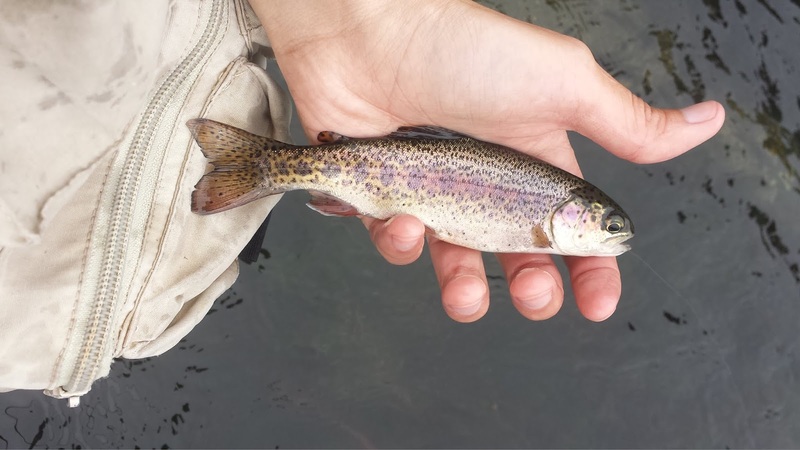 2 Trout limit - Minimum size limit 18 inches total length. 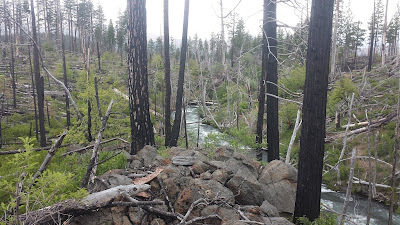 Both upper and lower Hat Creek are very accessible as HWY 89 parallels most of the creek up to Cassel. Primary access points to upper Hat Creek are in and around the numerous campgrounds near the creek. Hat Creek campground is one of Hat Creek's first campground. It is south of Old Station closer to Mt Lassen making it a bit more scenic than the other campgrounds. Cave Campground is the first campground north of Old Station. Across from this campground you can find entry to the Subway Cave which is an ancient lava tube. Rocky Campground is the second campground heading north. It is a nice spot to fish with plenty of holding areas for fish. 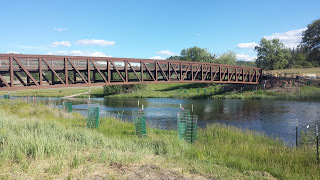 Bridge Campground, perhaps the most popular campground, is the third campground further north and is very nice with a bridge overlooking Hat Creek. Honn Campground is the fourth and final campground north of Hat Creek. It is right off the HWY and presents as less developed than the other campgrounds. In between upper and lower Hat Creek is Baum Lake. There is no overnight camping at Baum Lake however you can find plenty of campsites near the lake at Cassel Campground. Lower Hat Creek begins at Powerhouse #2. There is a maintained road that leads you down into lower Hat Creek that ends at the Powerhouse #2 parking lot. You can also access lower Hat Creek at Hat Creek park. The creek is deeper in this section making it difficult to fish from the bank. The furthest access to lower Hat Creek is off a forest road downstream from Hat Creek park. The season on Hat Creek always starts off well as the creek is spring-fed and generally not affected by the spring run-off. There are many different insects that can be hatching during this time of year however the most common patterns that you should always bring are PMDs and BWOs patterns ranging from size 14 -20. I usually find the strongest hatch mid-morning and in the evening about an hour before sunset. As the weather warms in May the Salmonfly hatch begins giving you an opportunity to throw big stonefly patterns. Dry fly fishing on Hat Creek in the early summer continues to be best during mid-mornings and evenings. Must have fly patterns to bring in the summer are caddis, trico, and yellow sally patterns again in size 14 - 18. June will bring about the Green Drake hatch allowing you to again throw big patterns to rising fish. Mid-day on Hat Creek is best fished with a hopper dropper. I like to sight fish for fish that hang out near the bank during the mid-day slump. Hat Creek tends to fish exceptionally well in the fall. Fishing pressure is pretty much nonexistent giving you tranquil access to the entire creek. The caddis hatch will still be around with less and less activity happening each day as winter approaches. 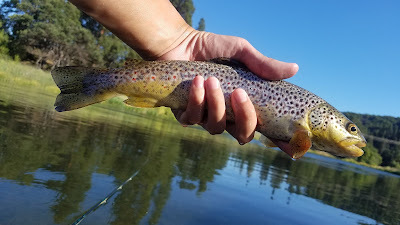 The trico hatch is one of the better hatches and can be caught in the morning. The October Caddis hatch happens in October giving you one last opportunity to fish big patterns for educated spring-creek trout. BWOs start becoming a prominent hatch as the weather cools. Overcast days tend to bring the strongest hatches. The upper section of Hat Creek is primarily a freestone fishery made up of riffles, runs, and pools. This area is affected by the spring-run off therefore flows for fishing aren't ideal until about June. With plenty of places for fish to hold this section is much easier to fish than the lower section. All techniques work well here so it's just up to you to choose what you want to do. The lower section of Hat Creek is a spring creek fishery that offers one of fly fishing's greatest challenges. Stalk, cast, and pray. Dry fly fishing usually takes place mid-morning or in the evening. Although hatches can happen sporadically throughout the day you'll have the best chances of fooling fish during low-light periods. These fish are incredibly difficult to target when they are feeding on top. They tend to key in on both specific stages and insects that are sometimes hatching all at the same time. Bring several different flies and their respective stages. I have found that downsizing the pattern that the fish have been refusing can work well. Use 12ft long leaders with light tippets. I've gotten away with 5x but have done much better on 6x. The perfect drift is sometimes not enough. Try twitching your dry to get the fish you are targeting to react. If all else fails know you are not alone. Nymphing can also be done in the spring creek section with good results. Nymphing can be a good way to enjoy fishing the creek when nothing is happening on top. The best way to nymph lower Hat Creek is with a hopper dropper rig. The fish will most likely not eat the hopper but they will most definitely eat the dropper. Most of the creek isn't very deep however the gradient can change quite quickly. I sometimes find myself adding a small splitshot like a #4 or #6 in-between my hopper and dropper to help my dropper sink quicker. Takes will be super subtle so pay very close attention to how your indicator fly moves. Powerhouse #2 Riffle is the most popular spot on lower Hat Creek as it is the only riffle in the spring creek section. For some reason it is the only place I see fly anglers fishing when I'm out there. 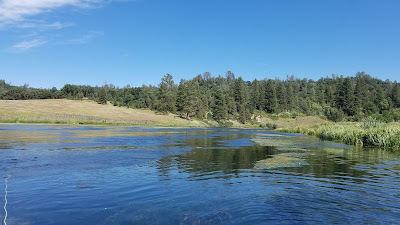 The riffle is very shallow only about ankle deep and receives tons of fishing pressure. I recommend anglers go downstream and explore the spring creek flats to experience what makes lower Hat Creek truly special. 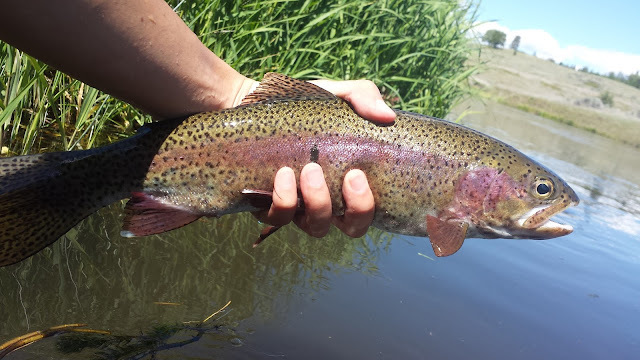 The average Hat Creek fish are about 8'' - 12'' and anything over that is uncommon. I've seen some nice size fish in the +16'' range but nothing like the fabled +20''ers though I know they are in there. Despite being a bit small I find that these trout fight much harder than any other trout in the surrounding area. 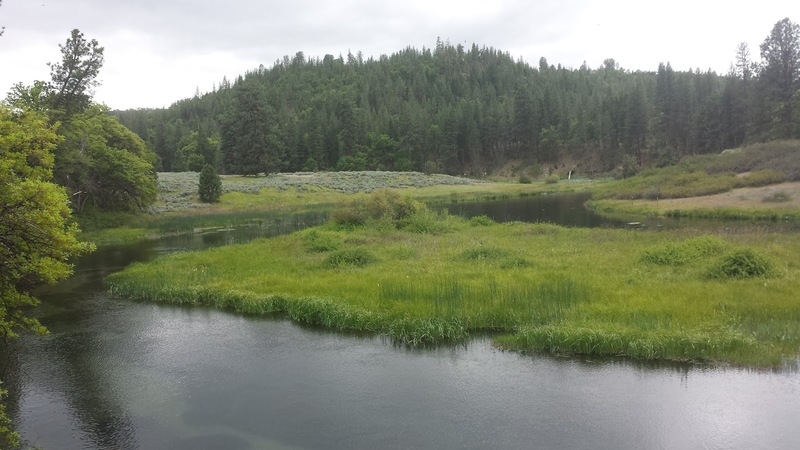 There is a lot of interesting fly fishing history about Hat Creek. Hat Creek is recognized as California's first wild trout water and in the 1970's use to be a world class fly fishing destination. The creek has since declined due to a sediment plug burying a majority of the creek's aquatic plant life. Invasive muskrats have also contributed to eroding the banks making the creek wider and shallower over the past few decades. Caltrout, Trout Unlimited, and many other agencies have recently come together to work on restoring lower Hat Creek back to its former glory. Bring mosquito spray! There are always a ton of mosquitos out there in the evening.